If you are looking for a day out with a difference, why not visit Chester? Chester Zoo has approximately 1.9 million visitors each year – and the reasons are obvious – Chester Zoo is one of the best Zoos in the UK with over 15,00 animals and 125 acres of award-winning zoological gardens! Available activities at Chester Zoo are varied and with the opportunity to get involved in many fun and educational scenarios – both with regular events throughout the year and some that are season-dependent. Blue Planet Aquarium in chester is home to over 100 living displays, which includes one of Europe’s largest collection of sharks. At Blue Planet you are sure to have a fun-packed day for adults and friends alike. Based in Cheshire Oaks, Blue planet boasts many attractions, from coral caves, undersea walkway Shark Dive encounters (for both adults and children) – the list goes on. Facilities at Blue Planet include our family restaurant with hot and cold meals available as well as snacks to ensure that your visit remains as comfortable and enjoyable as possible. 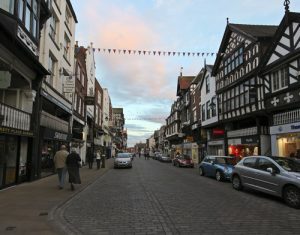 Chester, one of the UK’s heritage cities dating back to Roman occupation has seen Chester have it’s own Amphitheatre where at one point in history it had the capacity to hold and entertain 7,000 people who could be entertained by gladiators, festivals and other entertainments from days gone by. Now it is the home to entertainment, music events, family Saturdays – and remains as being the largest so far uncovered – read more below and see what events are happening right now! Chester racecourse is known as the Roodee, and according to today’s records it is officially the oldest racecourse in England, that is still in use. In the heart of Chester the racecourse location makes it very popular with visitors to the city, making it very accessible for people to be able to enjoy a day or night out racing and offering very easy access to hotels, restaurants and a whole host of other facilities. Chester now hosts corporate events, weddings conferences as well as both Racing and Polo events. Whatever your reason for visiting Chester Racecourse, your experience will be an enjoyable and one guaranteed to remain in your memory forever! A true gem of a venue to visit. Maybe even make the whole day that bit more special by hiring a limo to travel in Chester in true style! Chester Cathedral is a breath-taking experience to witness, an ancient abbey, a cultural place of interest, and so much more. In 2015 the cathedral won the ‘Large Visitor Attraction of the Year Award Winner 2015’ – described as a wonderful place right in the heart of the city. Add to the mix, the characteristic town, shops, streets, the quirky bars and restaurants – and you are guaranteed for a great day out in Chester.